Studio Ghibli's first foray into videogames is almost finished, and Namco Bandai has revealed that you won't need an import to experience it yourself. 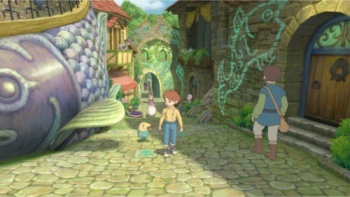 After what's now been three years of speculation, Level-5's previously announced artistic RPG Ni no Kuni: Wrath of the White Witch is officially confirmed for an American and European release sometime in 2012. Level-5, perhaps most famous for its highly popular Professor Layton puzzle series, has teamed with anime powerhouse Studio Ghibli to produce the game, borrowing the studio's famed animation style to create what's shaping up to be one of the most visually unique RPGs on the market. Namco Bandai will be publishing the title outside of Japan. "It was a momentous experience to create a game with artists who represent Japan as much as Studio Ghibli and Mr. Hisaishi do," said Akihiro Hino, President of Level-5. "We sincerely want to share this title with the entire world." In the game, players will control Oliver, a 13-year-old boy whose mom suddenly passes away. Soon after, he meets up with a fairy and travels into an alternate reality of the town he lives in, where he will interact with strange versions of the people he already knows and search for the secret to bringing back his mother. While no official release date or pricing has been announced for its Western release, Ni no Kuni will be out in Japan on November 17th for 8800 Japanese yen. Doing a quick conversion to American dollars puts the game at about $115 for the plain ol' standard edition (yikes! ), so those interested in scooping up a copy will surely be hoping that it comes down a bit before its U.S. release next year. If it doesn't, I'm guessing GameFly might find itself with a few hundred new clients come 2012. Even if you wouldn't consider yourself someone "into" anime, it would be pretty difficult to have missed the impact of Studio Ghibli. Aside from giving us films such as My Neighbor Totoro and Howl's Moving Castle (some of the most successful Japanese animated features to hit Western shores), the studio even won the Best Animated Feature Oscar in 2002 for Spirited Away, still the only non-English language film to ever take the category. It should be interesting to see what the studio is able to bring to a new medium.